This is the tattoo I hope to get very soon, as soon as this Saturday, the 27. This means a lot to me, I drew it and it’s hard to explain. The fallen feathers seem to indicate a loss on an emotional, physical, and spiritual loss. 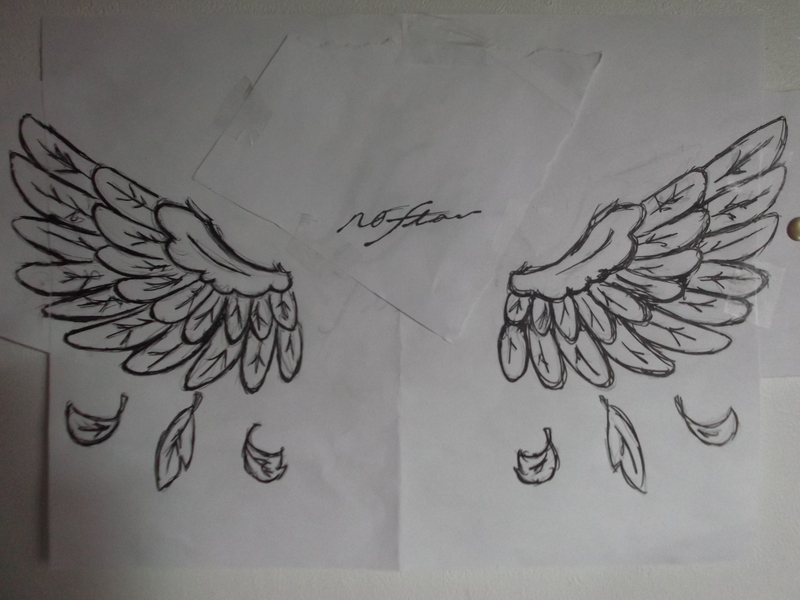 To me it is saying “Hard times may cause the feathers to fall off, but that will not keep my wings from flying.” The wings represent freedom, and my choices. It represents where I will go in life and what I want. The fallen feathers also mean “I love you” and “I hate you”. Those are two phrases that I rarely say anymore, because I fully understand what they mean, and they are precious and should be used sparely. The “I love you” phrase is something important to me because, it is hard for me to say it, in fear of being left behind. The “I hate you” phrase is something I never want to use again, because I know that I will never hate anything or anyone because I can’t. It’s too hard and stressful to hate things. And hate is the most powerful word. A strange thing too, the first set of feathers the base of the winds have 6 little bumps in it represent my mothers maiden name and the last name I want to keep, Powell. It my last name, my mothers, and my favorite grandparents. Plus cousins. The Powell family is great, and I wouldn’t want any other last name. It’s also Finnish. Finland is beautiful and I want to visit someday. The row with nine represent my name, Paige Lynn. I love my name, it was chosen by my parents who were in love and not any longer. There are 10 feathers on the last row and that represents my fathers last name, Provencher. It means a lot to me because I used to be a daddy’s girl. I am no longer. “No fear” is meant to mean no fear. I am so afraid of a lot of things and in my future travels , I hope to no longer be afraid. It’s meant to keep me from being afraid to fall in love and get hurt as well. The wings in general, to me, mean that I want to be as fast as I can. I love to run and I want to run with all my might. When I run I feel like I am flying and I love that feeling. Another random and stupid thing. Over all there are 56 feathers on this tattoo. 6-5 is 1, and that’s my future. 5-6 is -1, and that’s my past. 5+6 is 11, and 1-1 is 0 and that is my present, the me right now. Previous Post The thoughts that cloud my mind and heart.